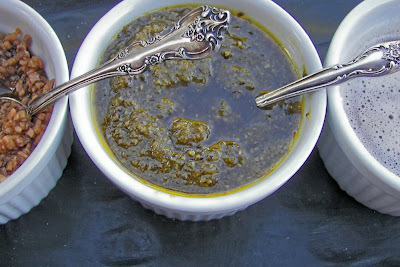 Do you like to travel and then come home and relive your travel memories by making the food you ate on vacation. 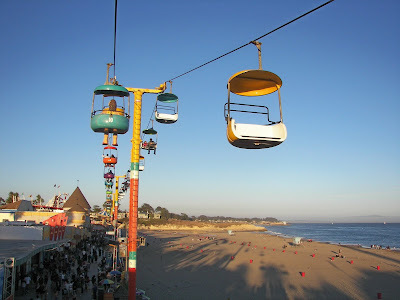 On our recent family summer vacation we went to Santa Cruz, California! 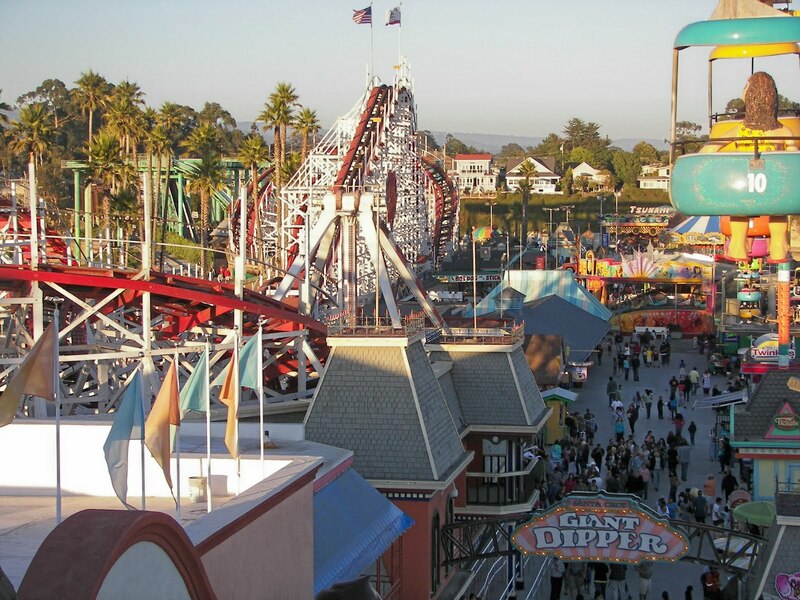 The Santa Cruz Boardwalk features carnival-type food and games, great thrill rides and a great swimming beach! 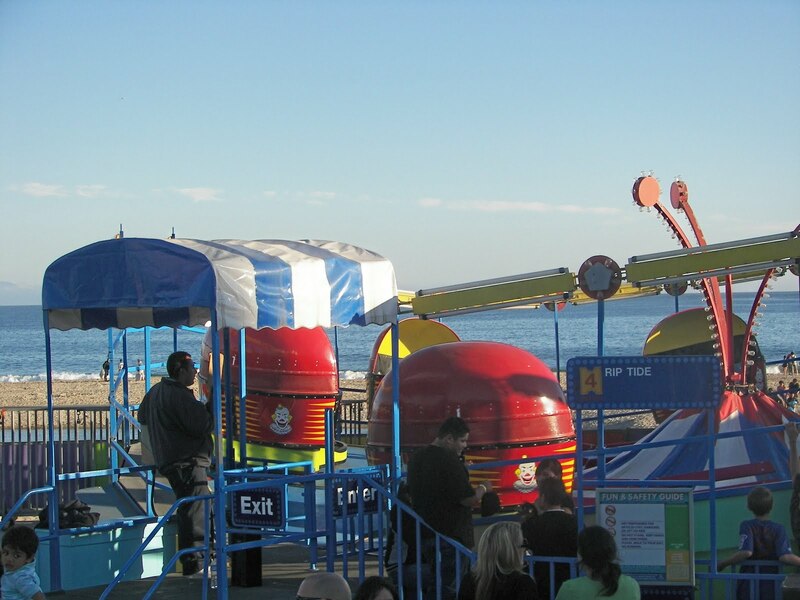 Santa Cruz was my children's favorite part of the trip. On the Boardwalk you can find Deep Fried Twinkies, Funnel Cake, and grilled corn with toppings. All of these food offerings were quite popular. I will include some photos first of Santa Cruz and then we will travel to Inverness. 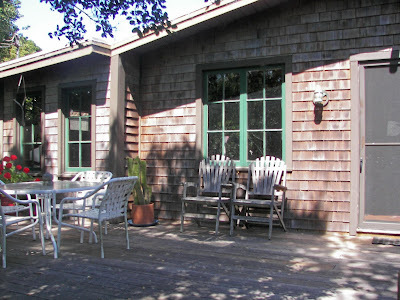 You can't find two more dissimilar coast locations than Santa Cruz and Inverness. At the end of the post, I will show you the grilled corn I made and the toppings. 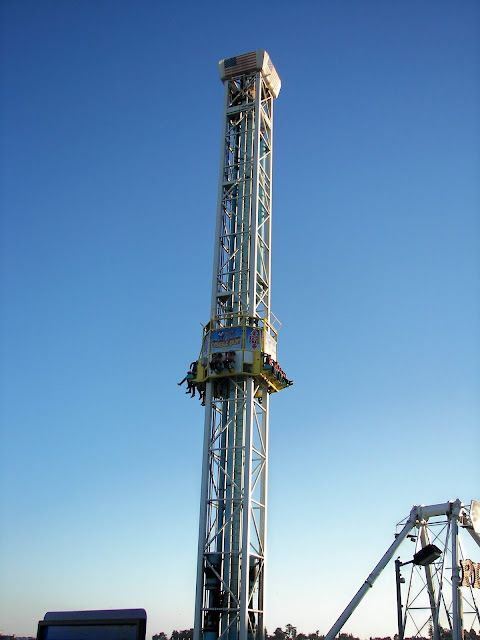 I loved riding on the SkyCoaster as you had such a great view of the Boardwalk, the rides and the ocean. It was Dollar Night at the Boardwalk. There is no entrance fee and all the rides were one dollar, no exclusions. Hot dogs, pop, and cotton candy were also just one dollar. Even though it was dollar night, there really wasn't a lot of waiting. 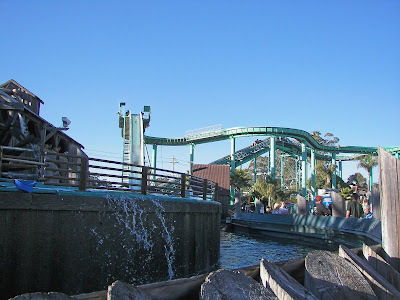 The Giant Dipper, the classic white wooden structure. 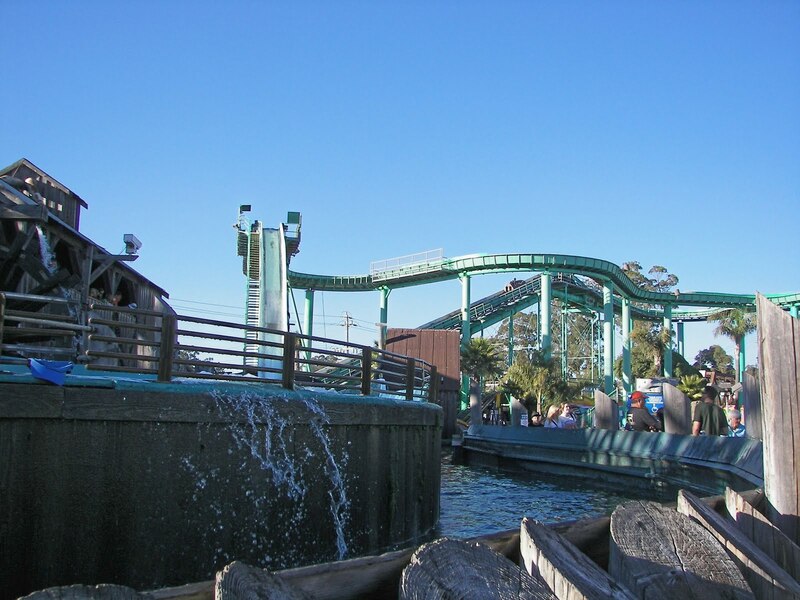 is a wooden roller coaster that has been named a National Landmark. Over 50 million, that includes me, people have taken a ride on the Giant Dipper; it first opened in 1924. As I get older roller coasters just don't appeal to me like they used to. Since it was a National Landmark I HAD to ride and I conned my husband to ride too! I DID open my eyes three times during the ride....honestly I did! My son rode the 125 foot Double Shot...not me! The log ride was a hoot! 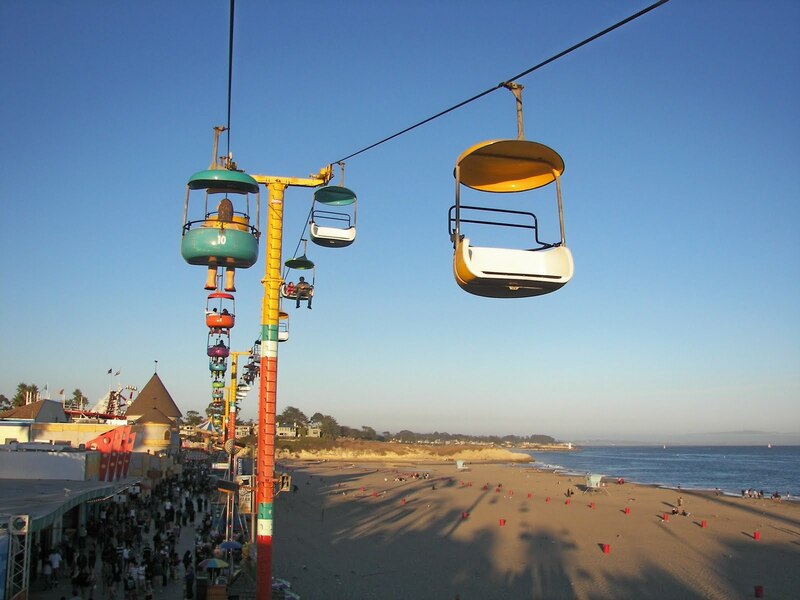 There's just something about rides on a beach. 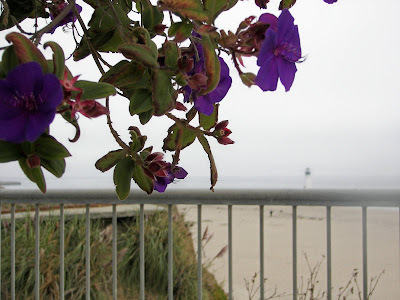 At Seabright State Park, which is adjacent to the Santa Cruz Boardwalk, there is a small lighthouse. At night you can build a fire in the fire pits on the beach. 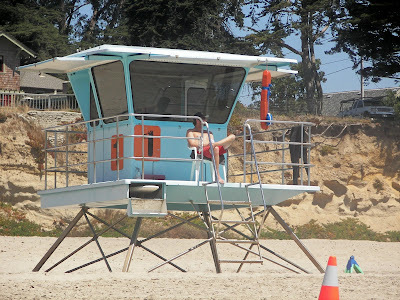 There are lifeguards on duty and this area in Santa Cruz is probably the most swimmable, temperature-wise, beach in Northern California. 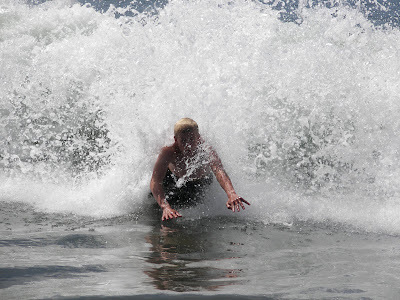 Since my son had never body surfed before, it was good that there were lifeguards. 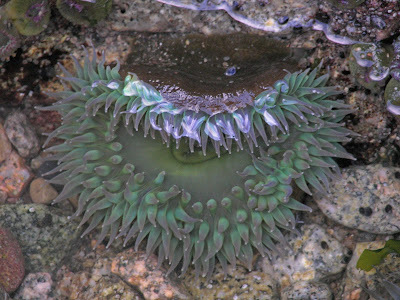 After two days at Santa Cruz, we traveled to Inverness to spend some time with a friend. Joan has a share of a house in Inverness which means that she is able to spend about nine weeks a year there. Inverness is in west Marin County, located on Tomales Bay, and is about an hour north of San Francisco. There is Spanish moss in the trees and a huge amount of vegetation at Joan's vacation home. There is an osprey nesting in one of her trees. Convenient t to Inverness is Chimney Rock Beach. 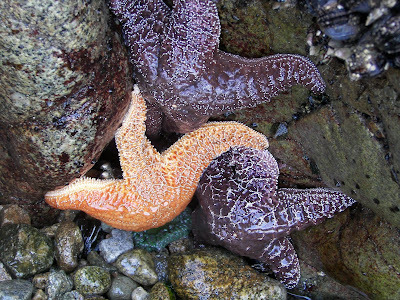 Even though it wasn't low tide, the kids were able to climb over the rocks and find some sea life. I sat on the beach and enjoyed an otter surfacing from time to time while he was eating. My husband and children explored on the rocks. Years ago, on an earlier trip, at Chimney Rock, we were able to witness seals released from captivity. As the seals were released they tried to come back to shore and the volunteers had boards to keep them from coming back. It was an amazing sight. The weather on the Northern California Coast is very changeable. Fog began to roll in. 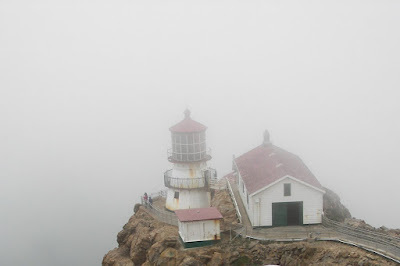 By the time we went to Point Reyes Lighthouse, we were fogged in. 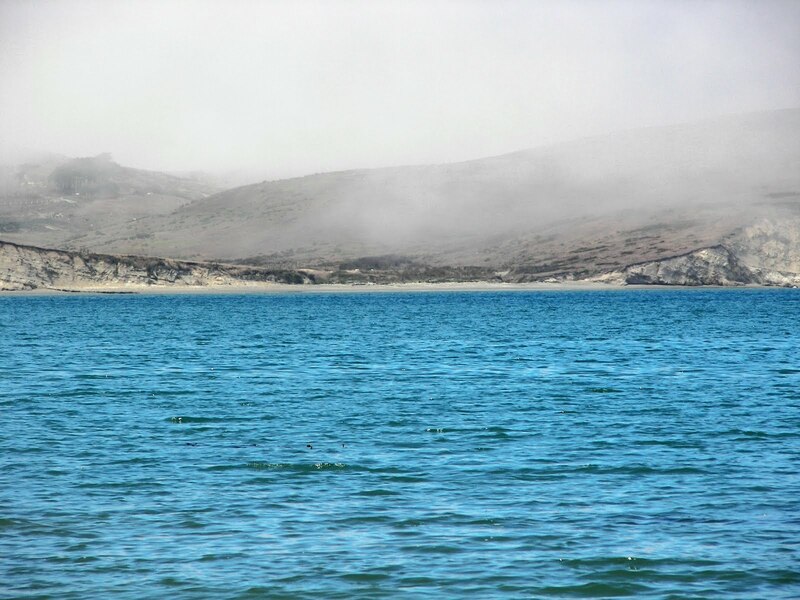 Point Reyes is the foggiest and windiest place on the Pacific Coast. It WAS cold, wet, and windy! To get to the lighthouse it is about a mile walk and then another 308 stair steps. 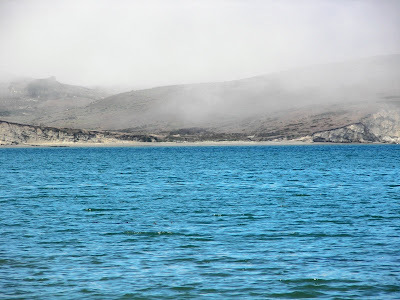 At the visitor's center, there was a sign saying that "grey juvenile whales" could be spotted today. We weren't disappointed! Because we were high above we were able to spot them so well. Unfortunately, my older children, who at first decided that they didn't want to make the jaunt to the lighthouse, weren't able to see them! They later came, but the whales had moved on. Point Reyes Lighthouse in the fog. Point Reyes was first opened in 1870 and decommissioned in 1975. 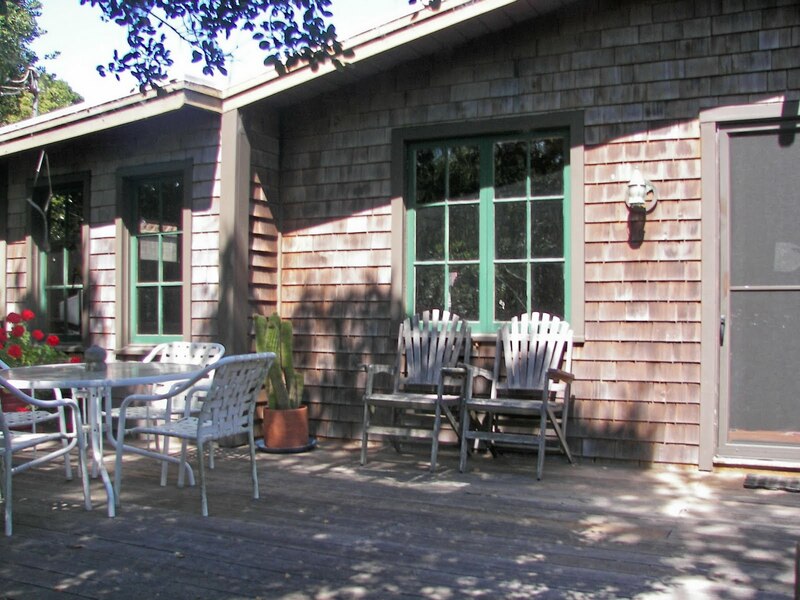 In 1951, Clint Eastwood crashed in a military airplane about 2 miles north of Point Reyes. With the help of a lifeboat, he was able to make it safely to shore, which would have been no small feat in these waters. 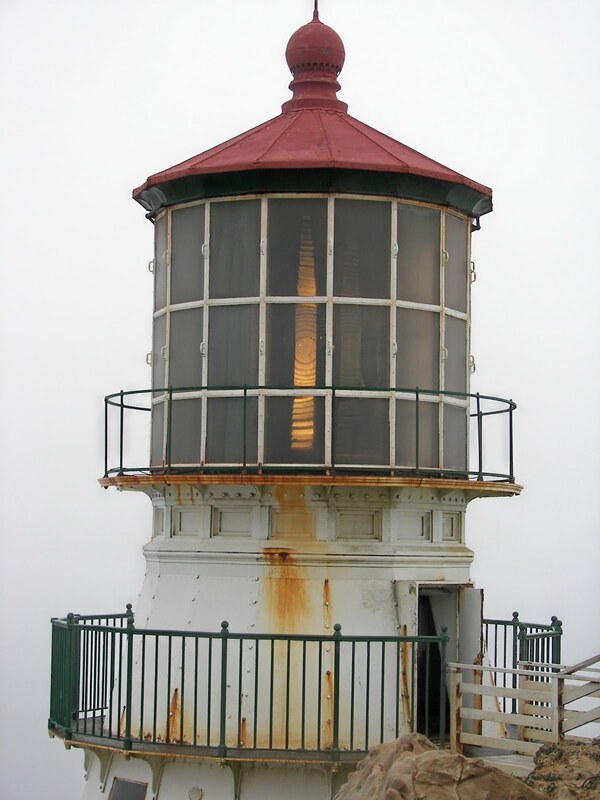 There is a beautiful Fresnel lens in the lighthouse. On the way up the stairs, which seems longer somehow than the way down, are numbered. My children went back to school yesterday so that is a sign that summer is official over for us. 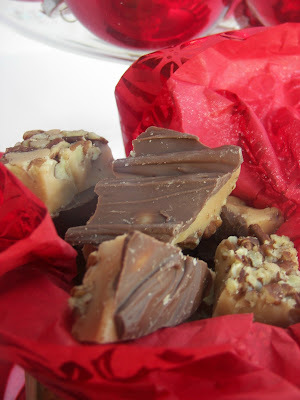 I have enjoyed showing you the sights and food inspired by our trip. See below for my version of corn served on the Santa Cruz Boardwalk. At the Santa Cruz Boardwalk, grilled corn was a popular item, for $4.00 per ear of corn! There were many toppings to enhance the flavor of the corn. 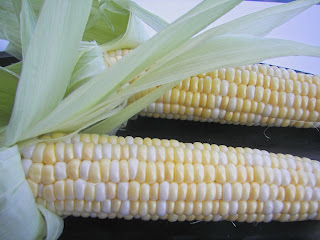 To grill corn, peel back the husks and remove the corn silk. If there are a lot of husks, remove some so that the heat of the barbecue can reach the corn. At this point, some people to prefer to soak the corn and husk in cold water for about 15 to 20 minutes. Turn on the barbecue grill to high, then lower to medium heat. 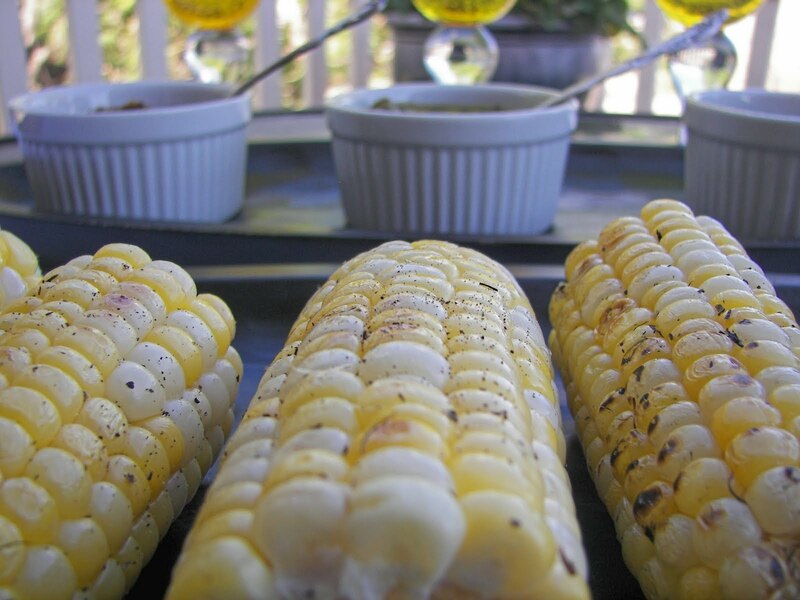 Brush corn with butter or olive oil. Pull husks over corn and put a little bit of kitchen twine to secure husks better to corn. Put corn on grill and grill until done, about 8 to 15 minutes, turning frequently. This is the tricky part. Just experiment with the time and watch the corn closely. I topped mine, from left to right, with prepared roasted garlic, prepared pesto, and brown butter and freshly cracked pepper. I loved the brown better best. The toppings are endless; you could top your corn with Parmesan cheese, bruschetta, salsa, sour cream and chili powder, and the list goes on and on. Be careful not to smother the wonderful taste of fresh corn with too much topping. 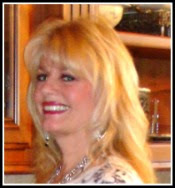 =Thank you for stopping by Red Couch Recipes and helping me finish my tour to Northern California! Wow, I love all your photos. I haven't been to an amusement park in more years than I care to count. What fun. Corn is so good right now. I could eat it for dinner every day. aww! I just moved to SLC from Santa Cruz. You sure hit the nail on the head. The corn at the boardwalk is delicious, and you can buy them at food carts outside many of the Mexican markets. Thanks for reminding me it's easy to bring back the taste of home! 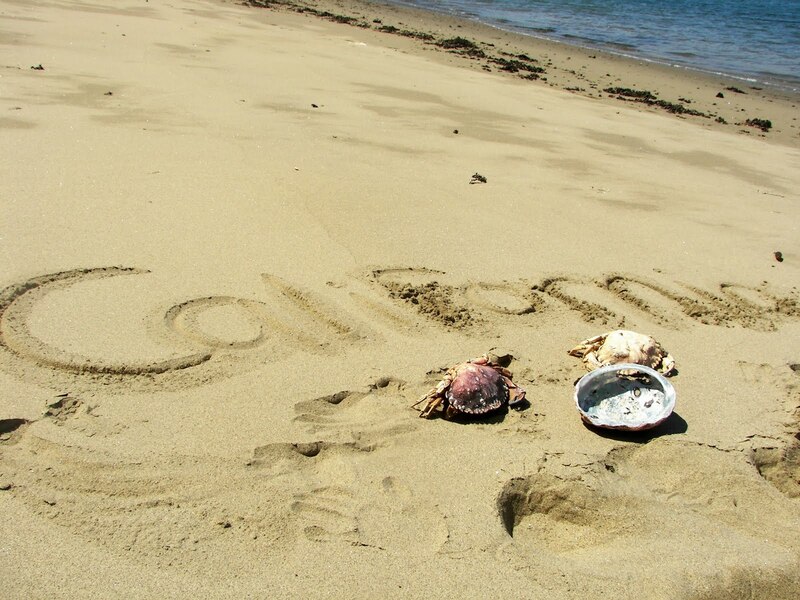 Having never been to California, I really enjoyed your photos. I don't ride rides anymore...I just eat and shop when we are at theme parks etc. The corn sounds great! What a delicious post! Great idea for corn. I just read your daughter's blog. I am impressed. Great job and the recipes look fabulous. I think that ginger and lime sugar cookie recipe is a keeper. Thanks for taking us along on your vacation. The pictures are so beautiful! 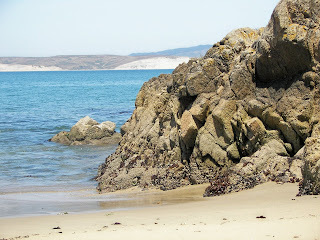 I love the lighthouse at Point Reyes and love Tomales bay. How wonderful that you could spend so much time there. You photos bring back such great memories for me. We did our corn this way on the grill last week. I hope to be able to try it again before the good weather goes. Love your toppings! Oh, you've been to so many of our favorite places. Grilled corn with toppings sounds worth $4.00 an ear! So glad you had a great time with your family...hope to see you this week end!!! I had grilled corn for the very first time this summer. My daughter grilled it, but after removing the silk and before bringing the husk back up for grilling, she squeezed the juice of a lemon and an orange over the cobs. Delicious! Joni, What a great trip you had! I enjoyed reading all your posts and looking at the pictures. Thanks for sharing them! I love to travel, and today I was able to vicariously come along with you to California.